Did You Know Michael Caine is a Korean War Veteran? On his very first night, he witnessed a Chinese attack on a position to his left. Michael Caine is one of the most well-known and highly-regarded British actors of the 20th and 21st centuries. He is famous for roles in movies like Zulu, Get Carter, The Eagle Has Landed, The Italian Job, Austin Powers in Goldmember, Christopher Nolan’s Batman films, and a host of others spanning an acting career of 70 years. While he has become a household name across the globe, a fact that many people don’t know about Michael Caine is that he served in the British Army and saw combat in the Korean War. It was a harrowing experience for the actor and one that would scar him for many years. Caine’s birth name was Maurice Joseph Micklewhite, and he was born in 1933 in South London to a working-class family. Caine’s father fought in the Second World War. His family, including the young Maurice (Michael), was evacuated from London due to the risk of bombing by the Luftwaffe. 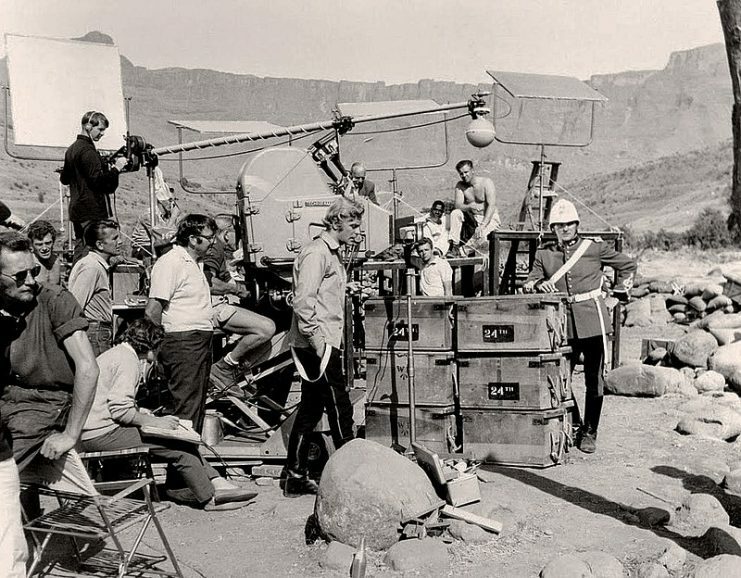 Behind the scenes on the location set of the film Zulu with stars Michael Caine and Stanley Baker. After gaining his School Certificate at the age of sixteen, he worked for a time as a messenger and filing clerk for a film company in order to a get a foot into the door of the industry. He was called up for national service from 1952 to 1954. He served with the British Army’s Royal Fusiliers, an infantry regiment. At first, he was posted to serve with the British Army Of The Rhine (BAOR), the British occupation force that had been stationed in Germany after the end of the Second World War. However, after serving there for a few months, he opted to transfer to Korea where a war was raging. 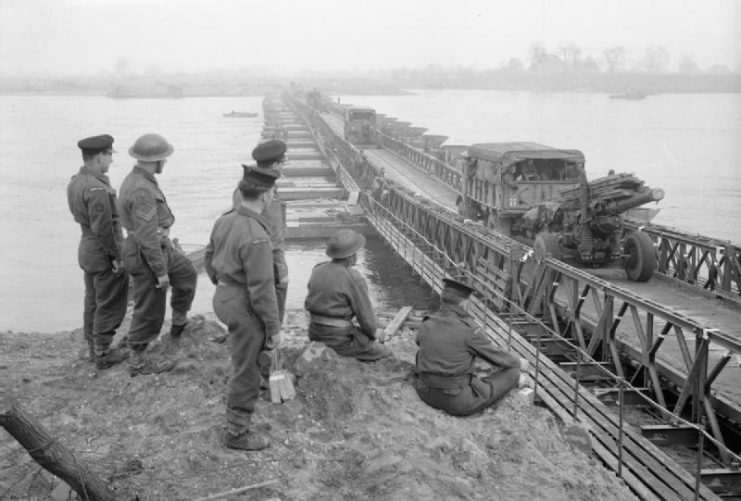 Royal Navy and Army personnel are watching guns being towed across the Rhine after completing building of the bridge. The British Army in North-west Europe 1944-45. 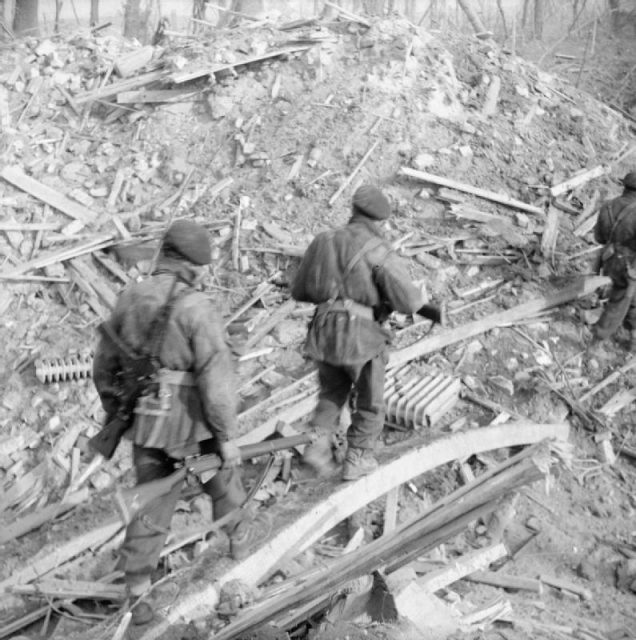 Assault on the Rhine and Capture of Wesel. Commandos make their way over a bomb crater. Going into combat would turn out to be an experience that would change Caine forever. Caine landed at Kure, in southern Japan, and underwent two weeks of combat training. After this, he was sent to the South Korean front, near Pusan. The front was unlike anything Caine had ever experienced. There were hordes of rats and vast swarms of mosquitoes as well as the ever-present stink of human excrement used to fertilize the fields. And, of course, there was the presence of thousands of North Korean and Chinese soldiers hell-bent on killing Caine and every other opposing soldier there. He spent his first few nights in a trench on a hill around a mile from the Chinese lines. On his very first night, he witnessed a Chinese attack on a position to his left. 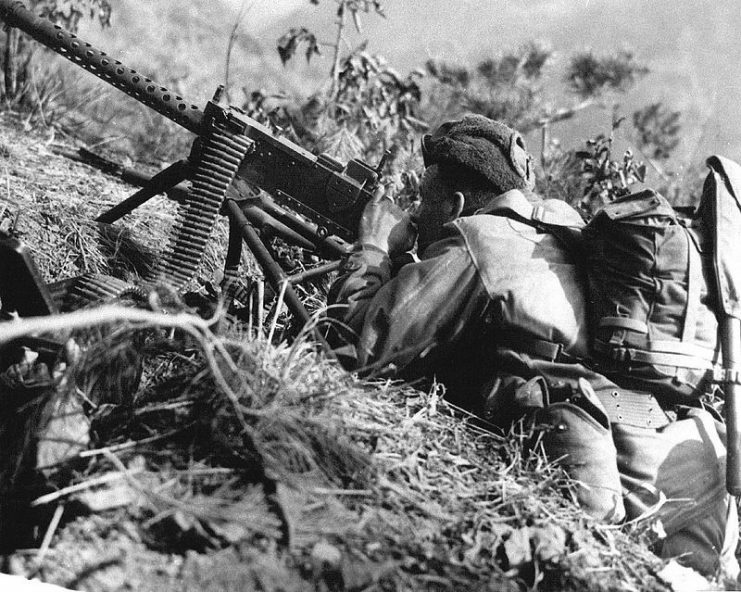 He watched with both awe and horror as the Chinese troops – who were clearly unafraid of death and fanatical in their cause – charged headlong into machine gun fire. 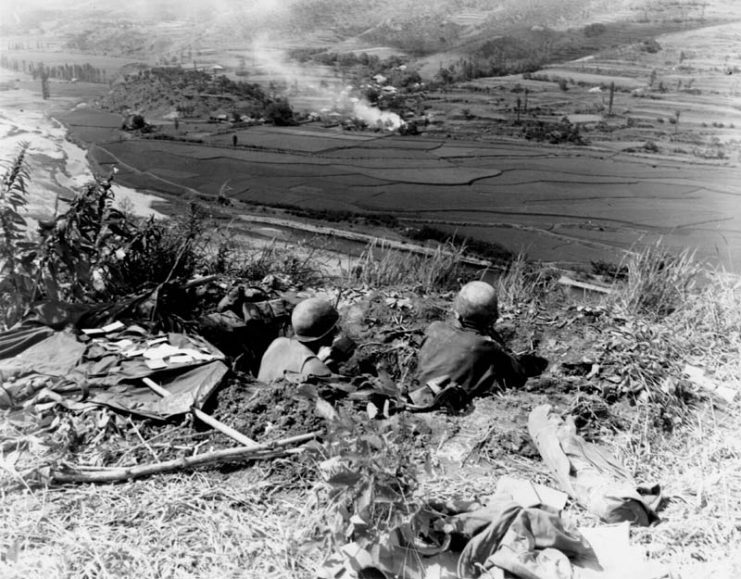 Troops await North Korean attacks across the Naktong River from positions on the Pusan Perimeter, September 4, 1950. He would end up being on the receiving end of more than one of these charges while manning an American .30 caliber machine gun. Some nights he would go out on patrol, and these were the most terrifying experiences he underwent in Korea. Sometimes, enemy bombardment of the trenches would continue for up to 24 hours without pause. Caine would simply lie in his camp bed in the bunker, listening to the shells whining and exploding, and wonder how he was going to get out alive. On one occasion, he came alarmingly close to being killed. Caine and two other men were out on patrol, creeping through the elephant grass at night. They suddenly heard the tell-tale clicking of rifle bolts snapping shut all around them, accompanied by hushed voices speaking excitedly in Chinese. They were surrounded and heavily outnumbered, and all three men were convinced they were about to die. In that moment, however, Caine recalls that he felt no fear. He “decided that whoever was going to take [their] lives was going to pay dearly.” So the three of them charged, roaring maniacally, at the voices. A .50 Cal. 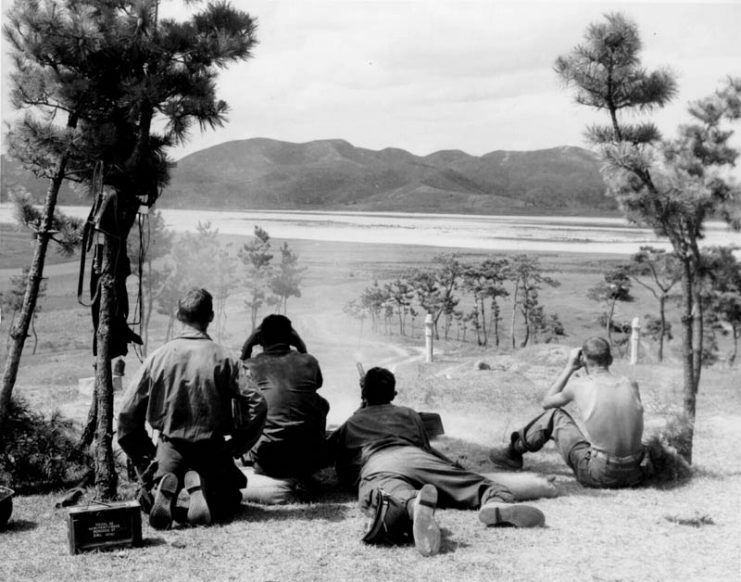 Machine gun squad fires on North Korean patrols along the north bank of the Naktong River, Korea. The Chinese opened up but were firing at the place where Caine and his companions had been a few seconds earlier, not where they were running to. The British mortars spotted the Chinese muzzle-flares in the darkness and opened up on them, scattering the enemy. Caine and his friends managed to get back to British lines and lived to fight another day. Caine stated that as the child of a working family who had grown up poor, he had been sympathetic to communism prior to his experience in Korea. But after he had fought the fanatical proponents of communism and saw firsthand how it dehumanized people, he changed his mind about it and came to greatly oppose the idea. 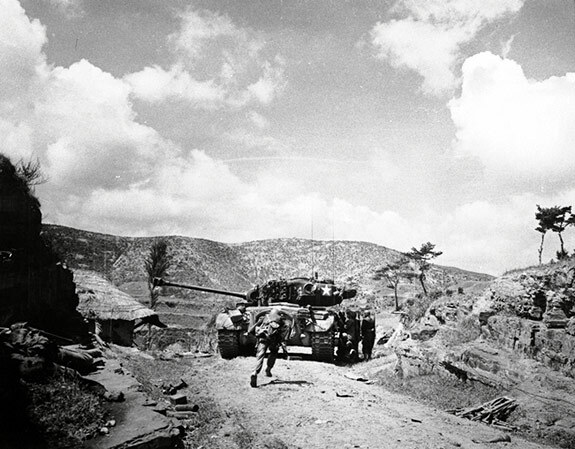 M26 tank west of Masan during Pusan Perimeter engagement, late summer 1950. All in all, he was in Korea for a year. He spent six weeks at a time in the trenches followed by two weeks in Seoul for R&R, during which time many of his fellow soldiers were infected with gonorrhea. Caine, due to his refusal to see prostitutes, never contracted the disease. He left Korea a profoundly changed man, grateful at having survived the war. He had been forced to grow up very quickly, and he’d learned a lot about himself and the world. 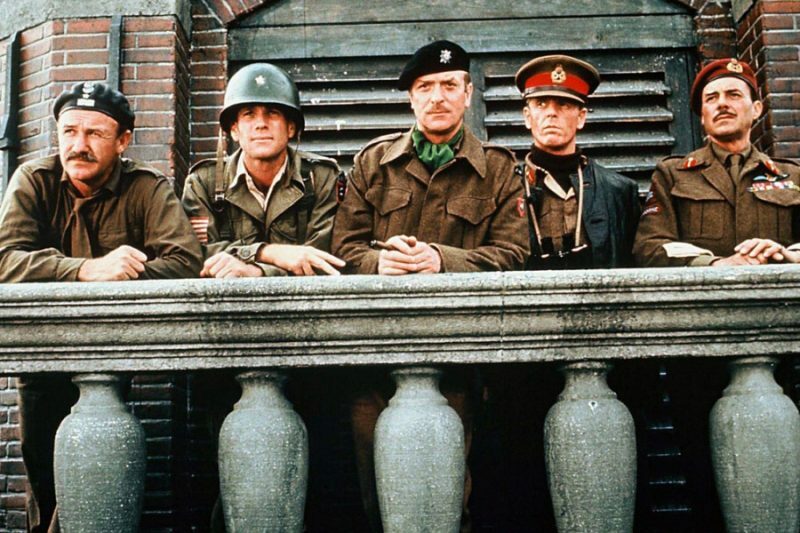 He used his military experience in a number of roles in which he played military men and, despite his humble background, ended up becoming an icon of British and international film. 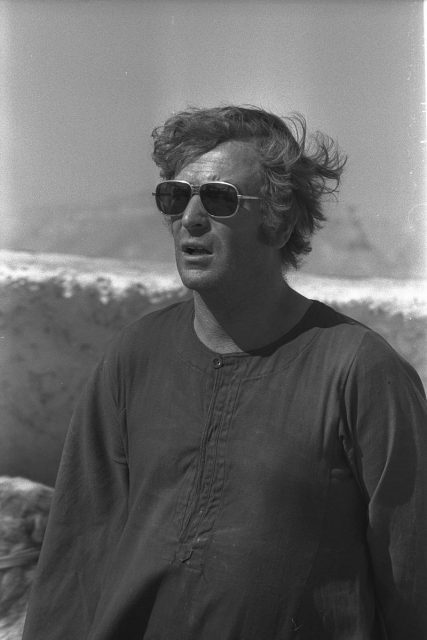 Caine, currently 85 years old, is still acting and has no plans to retire as yet.